Way back in the early 90s, the Street Fighter II arcade machine began with, appropriately enough, a street fight. But who are those two gentlemen engaging in unsanctioned fisticuffs? As of today, one of gaming’s greatest mysteries has finally been solved. Anyone who played Street Fighter II back in the day likely remembers the game’s brief intro scene. There are a couple of guys squaring off amidst a crowd of cheering bystanders. A single punch is thrown, resulting in a knockout, as the camera pans up the side of a skyscraper in the background to reveal the Street Fighter II logo. For those young whippersnappers in the audience who have no idea what an arcade machine looks like, here’s a video showcasing the original Street Fighter II intro. The scene I’m referencing takes place over the course of the initial 12 seconds of the video. What’s interesting about that clip is that those two characters don’t actually appear in Street Fighter II. In fact, they’ve never actually appeared in a Street Fighter game, meaning their identities were a complete mystery. Until now, that is. Perhaps in celebration of the game reaching its 25th birthday, Capcom has finally released information about those two brawlers, including complete bios. The folks over at Eurogamer stumbled upon the Japanese announcement, which was then translated by fans. The first chap – the one who threw the punch and can be seen at the top of this post – is actually named Scott. He’s 6’3 and weighs 209 pounds. Because this is a Japanese fighting game, we also know that his blood type is B and his birthday is Sept. 10. Hailing from the U.S., his likes include street fighting and his dislikes are, well, caterpillars. A former boxer, Scott now works as a bouncer at a bar and likes to fish on the weekends. Max, the man receiving the knuckle sandwich in the intro, is 6’1 and weighs 205 pounds. His blood type is A and he was born on April 1. Also from the good ole’ U.S. of A, Max likes “himself,” gambling and things that sparkle. He’s not a fan of “simple things.” Also a former boxer and mixed martial artist, Max was banned from organized sports due to poor behavior. So there you have it, folks. 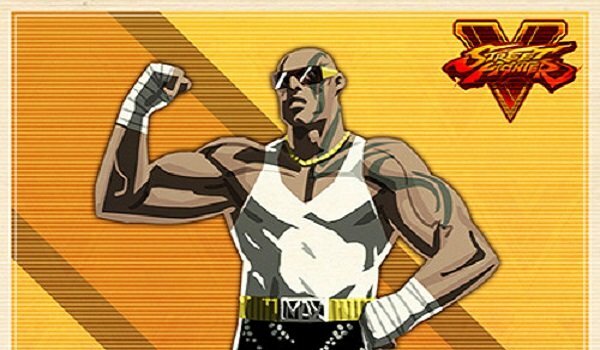 Everything you didn’t know you wanted to know about two characters who have never appeared in a Street Fighter game outside of that legendary intro scene. That has, of course, got us thinking. Why would Capcom bother giving this duo so much attention after 25 years? Perhaps we’ve got a couple of new fighters coming to Street Fighter V? Nothing is official, but those logos included in the bio pics certainly have us hopeful.